Not long ago, I had a conversation with a good friend from my country of birth, Mexico, in regards the terrible situation this wonderful nation is going through: after a long period of right, center-right and hypocrite leadership on the power, the country elected a candidate who, although comes from the same old corrupted school – with Honours-, presented himself as the messianic alternative and, just after 100 days as president, has managed to divide the country - lot more than it was -, create his own army based police, a new long lasting debt, downgrade the qualifications of trust for foreign investment and, by the way, break at least half dozen of his campaign promises - the last happened before he actually took over the presidency. Yet, millions believe, only God and they know why, that he will be the actual change-for-better trigger. With all these wonderful news, I wondered: How far can we go against the stream and survive before we give up and follow the lead of the masses? How strong our principles can be, to stand before those changes and live our lives no matter the consequences? Well, for all those Mexicans or from anywhere else in the planet, there is a book that talks about a man who may be a good inspiration: "The Spy and the Traitor". Ben Macintyre brought in this book, as he always does, a very well documented and detailed story: the life of Oleg Gordievsky. Created and indoctrinated by the KGB, the Soviet spy covered a post in Denmark, when he had the opportunity to get in touch with the Western world. Don't get me wrong, we all know that the way we currently live is unsustainable in several aspects and it is taking generations to change it, but certainly the access to the all cultural disciplines were definitely limited - in the best of cases - during the Soviet regime and the exposure to the music and literature during his post abroad where enough to seduce him to defect. But we are talking about the Cold War. Thatcher and Gorvachev were not there yet when he got into the espionage business. Later he would be the undisputable responsible to make the relation between the UK and the USSR to run smoothly when the aforementioned leaders met in a time that the market for government secrets, double-agents and propaganda was in bonanza. Risking his life and the lives of his family, Gordievsky did all what he could to spy for those that he considered the good guys in the movie and with that, becoming a traitor of his fatherland. I won't get into the discussion about ethics here. That is maybe the topic for another post in another blog. Some will consider him a hero, others a villain. As many individuals we are, opinions will be there. 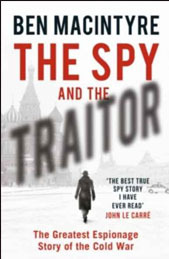 My suggestion is: for all those that are passionate for espionage stories, the appealing world of gadgets and conspiracies; for those that love history books and excellent journalism, The Spy and the Traitor will be an unforgettable reading.